Each week of Lent, we’ll provide an Ignatian prayer for you, inspired by a video from Arts & Faith: Lent. 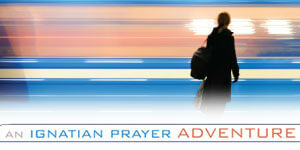 The video and prayer for the Third Week of Lent, Cycle B, are based on John 2:13–25. The art is “Jesus Chasing the Merchants from the Temple” by Quentin Matsys. Making a whip of cords, he drove all of them out of the temple, both the sheep and the cattle. He also poured out the coins of the money-changers and overturned their tables. …he knew all people and needed no one to testify about anyone; for he himself knew what was in everyone. The union in openness of body and mind and heart that is prayer begins with attention to each. First your body: Sit upright, legs crossed or not, feet on the floor or not, lower back pressed against the chair. Or not. Breathe. Now the mind: As you are able, let these words spill through the mind and down your spine into the earth. Let your thoughts puff away with each breath. As new ones come—knotted as they are with joy or pain—hold them like wounded birds. Set them aside to heal. Breathe. And the heart: Vulnerability means able to be wounded. Of course there is resistance. Notice it. With your breath and with energy, pull back the vines and push open your heartgate. Breathe. Tilt your chin up to the heavens and, with eyes open or closed, look back at the One who looks at you with great affection. Jesus did not need anyone to tell him about human nature, because he understood it well. Look to the painting. The reactions of the nine figures surrounding Jesus belie the passivity painted on his face. There is fear and sadness and certainly anger here. Let the scene unfold in your imagination. Let the chaos play as people flee from Jesus; let the conflicting emotions buffet one another back and forth. Where is your attention drawn? To any face in particular? To any emotion? Do you notice any sympathies arising for a Jesus who has grown so angry? Any resistances? Notice your reaction to the merchants and the Temple worshippers. How do you feel about their response to Jesus? Do they say anything to him? Does he respond? Jesus did not need anyone to tell him about human nature, because he understood it well. He understood what it was to want to run, what it was to have his heart crushed like tinfoil. He knew how it felt to be surprised unto bursting, filled unto tears with joy. And Jesus was a man who understood anger. Pause for a moment and notice the state of your heart at that idea. How do you feel thinking of a Jesus who knew the anger of others? How do you feel about a Jesus who knew his own anger? How does it feel to consider a Jesus who knows you in your own anger, both the just anger you have felt and the less-than-just? Do you notice any resistance? Any relief? Anger—real anger—only accompanies things and people we care about. It’s when something is out of joint with would-be recipients of our love that anger arises. What is it that makes you angry enough to make a whip of cords? Can you tell God about that anger? Are there times you have been angry with God? With Jesus? Can you let yourself feel that anger? Can you tell the Lord about it? How does he respond? Can you let him tell you about what makes him angry? Speak with the Lord now about what has happened in your prayer. Speak with him as with a trusted friend, one with whom you can grow angry and still be loved. If your parish is celebrating the RCIA scrutinies, see the video and reflection for Cycle A here. Fr. Paddy Gilger, SJ, is a pastor and teacher of sociology at Creighton University in Omaha, Nebraska. He is the editor-at-large of The Jesuit Post and editor of the The Jesuit Post book. He lives in hope of the Milwaukee Brewers being known for something other than the sausage races. Thank you for this reflection. “Anger – real anger only accompanies things and people we really care about.” How very true. I had been angry about a couple of things recently, but managed to not vent. Thanks be to God I did’nt; for it turned out in conversation, that the people I had been angry at had been having a difficult week themselves. I did feel relief reading about Jesus knowing his own anger and mine. It made me feel more comfortable and that he understands where I am coming from when I beat myself up too much with guilt.